Cheaper Hyundai Veloster Turbo for 2013 | What Car? Hyundai has confirmed production of a sub-20k cheaper version of the new Veloster Turbo. The Veloster Turbo SE, currently the only trim available, goes on sale next week, from 21,995. Hyundai sources have told us that an entry-level model will be available by early 2013, however. The cheapest Veloster Turbo is expected to cost less than 20,000 when it goes on sale early next year, and will include less standard kit and more optional extras. Equipment such as the media pack, which includes satellite-navigation, is likely to become a cost option, although sources suggest leather upholstery is expected to remain. 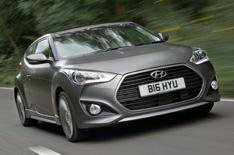 Hyundai hopes a sub-20,000 list price will lure potential customers away from the Velosters closest rivals - the Vauxhall Astra GTC and Volkswagen Scirocco. _Entry-level Hyundai Veloster is expected to cost less than 20,000 when it goes on sale in early 2013. A more competitive price tag means the turbocharged version will be available for similar money to the standard car, with prices for the Veloster Sport starting at 20,500.